We tend to think of warfare as advancing the technologies of weaponry and strategy, but contests on the world stage have also ushered in important changes to everyday life – like clothing. The significance of Army uniform design, its history in Australia and how it has shaped the civilian fashion industry was little understood until UNE historian and Adjunct Junior Research Fellow Anneke van Mosseveld began delving into the Australian Army’s archives. The resulting doctoral thesis – a revealing history of uniform manufacturing from 1912-1995 – was last week awarded a C.E.W. Bean Prize for Military History. Dr van Mosseveld was praised for her thorough research into “one of the most under-researched topics in Australian history”. 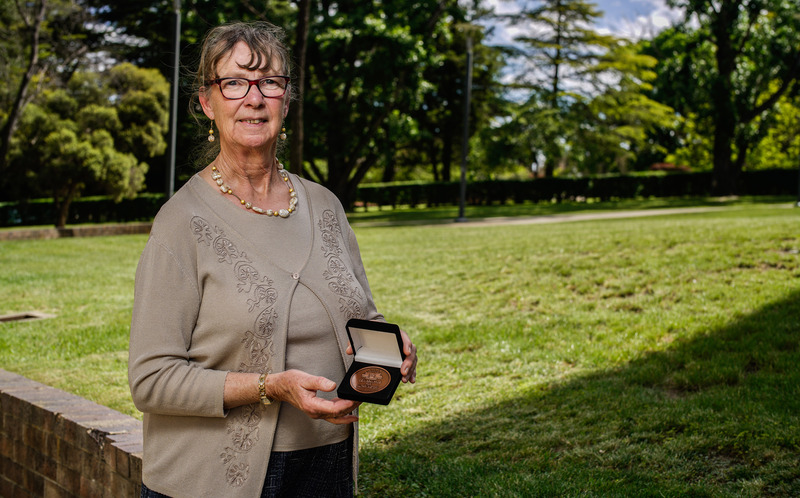 She received the prize from the Chief of the Army, Lieutenant General Angus Campbell, during a special ceremony at the Royal Military College, Duntroon. “Most people don’t think about the uniforms when they consider war; all the talk is of military strategy and equipment,” Dr van Mosseveld said. For more than 80 years, all Australian Army combat uniforms were made in a clothing factory, first established by the Department of Defence in South Melbourne, opposite the Victorian Barracks and later moved to Coburg. Throughout the 1930s the very best minds, artists and even zoologists were recruited to the Sydney Camouflage Group to determine the best combination of camouflage patterns and colours, and chemical companies such as ICI helped to develop the best fabric dyes to use. “At the height of World War I, about 700 civilians were employed at the factory and they produced tens of thousands of uniforms, constantly resupplying soldiers fighting overseas,” Dr van Mosseveld said. “In many ways they were at the forefront of clothing manufacturing. They pioneered sewing techniques and were the first to use some equipment, like buttonhole machines. But uniform design was as regimented as the Army itself. “Each design was documented in great detail, a sample made and that sample approved and registered, before it was sealed and stored to serve as the model for all subsequent uniforms,” Dr van Mosseveld said. By the 1980s, however, the business world was evolving and in 1995 the Army clothing factory was sold to private enterprise. Australian Defence Apparel, based in Bendigo, continues to make all Australian Army camouflage uniforms, although Dr van Mosseveld points out that it is part Canadian-owned. Her two-year-long research project brought together Dr van Mosseveld’s twin passions – industry analysis and sewing. “I had an interest, I suppose, because I understand patterns and the technology and machinery behind sewing,” she said. But Dr van Mosseveld is not ready to call a ceasefire on this fascinating research just yet. She is now considering looking into the smart technology being adopted in today’s Army uniforms – like fabrics that integrate sensors to detect body temperature changes and that have the ability to warn the wearer of improvised explosive devices nearby – and how uniform design is catering to gender differences.